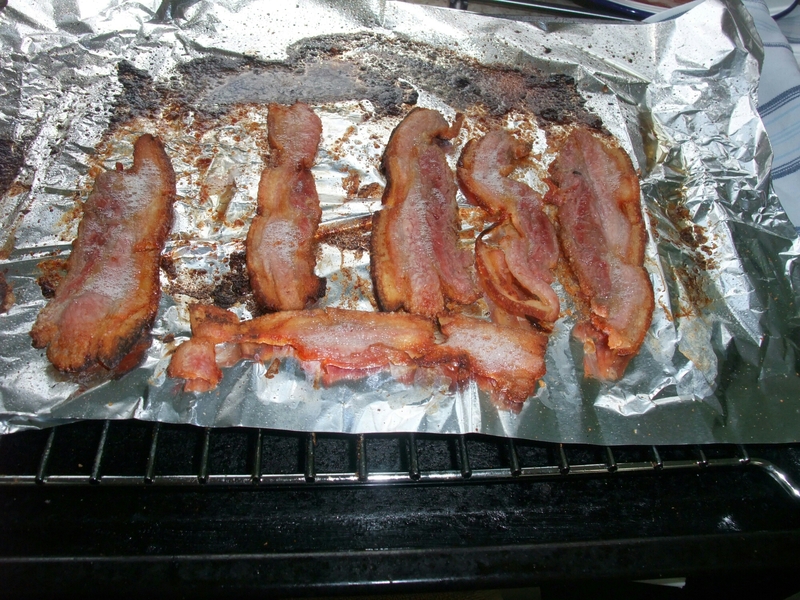 Who doesn’t love the smell of bacon cooking and who doesn’t also love the taste of hot crispy cooked bacon? Well OK if you are a veggie this may not be the case, although a few veggies I have known still find the smell of bacon cooking hard to resist. Think what it does to us carnivores – yep Homer Simpson-esk drooling!!!! When I was a student, oh so many, many years ago, one of the few things that got me out of bed before 11am was the smell of cooking bacon wafting up the stairs. We had grants and were eligible for housing benefit back in those days so could afford bacon! Now think how satisfying it would be for that lovely bacon to have been made by your own fair hand rather than having to buy it (and the good stuff is not cheap and the cheap stuff is not good). You can flavour it with what you like (within reason) and it is actually remarkably easy to make with the hardest bit being the waiting (isn’t it always) whilst it cures. My approach to curing bacon is somewhat unconventional. I have tried dry curing and found the results unduly salty for my tastes (I undoubtedly did it wrong, but once bitten and all) and the process of having to turn the pork every day is a bit of a faff (yes I am that lazy). To the probable disgust of purests I cure my bacon by brining it and by brining I mean submerging a pork belly in a salt based solution (the brine) for a period of time. 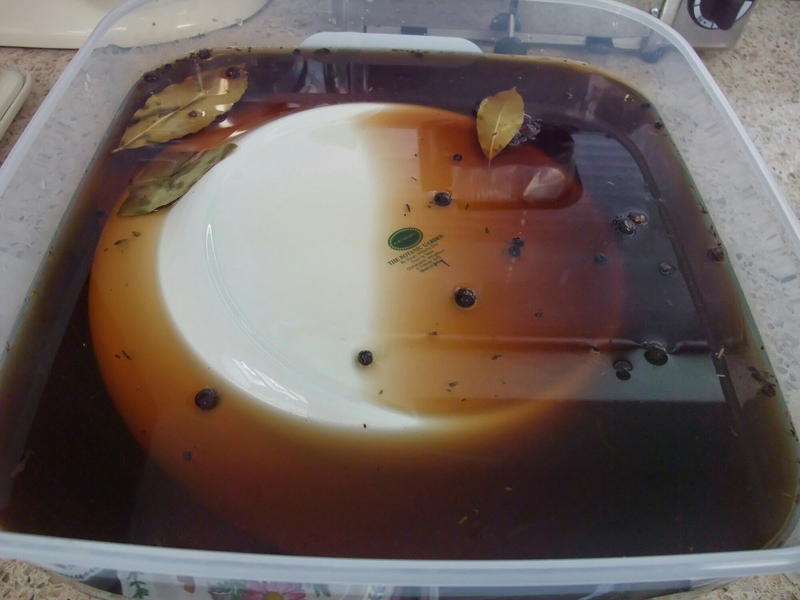 The brine is based on a recipe for salt beef (I did say it was unconventional) from Hugh Fearnley Whittingstall’s great book, Meat, which I have tweaked. • 1.5kg (bone out weight) Pork belly joint (if you go bigger increase brine ingredients accordingly – I personally wouldn’t go smaller). If the joint has the rib bones still on it, take them out before brining (they can then be used for low and slow BBQ ribs) as they will impede the curing process. • 750g salt (I used table salt to keep cost down –Hugh FW ,who clearly has bucket loads of cash to burn, says use flaked sea salt! Don’t think so Hugh). You can be inventive with the flavour (e.g. allspice berries instead of juniper and maple syrup or molasses in place of some or all of the sugar). Is a case of whatever floats your boat. The purpose of the saltpetre is to keep the bacon pink after it is cooked otherwise it goes a rather pallid grey (tastes the same but doesn’t look quite right). As saltpetre is, I understand, a component part of gunpowder I suspect I may need to welcome the NSA and GCHQ as readers of the blog (enjoy guys). 1. 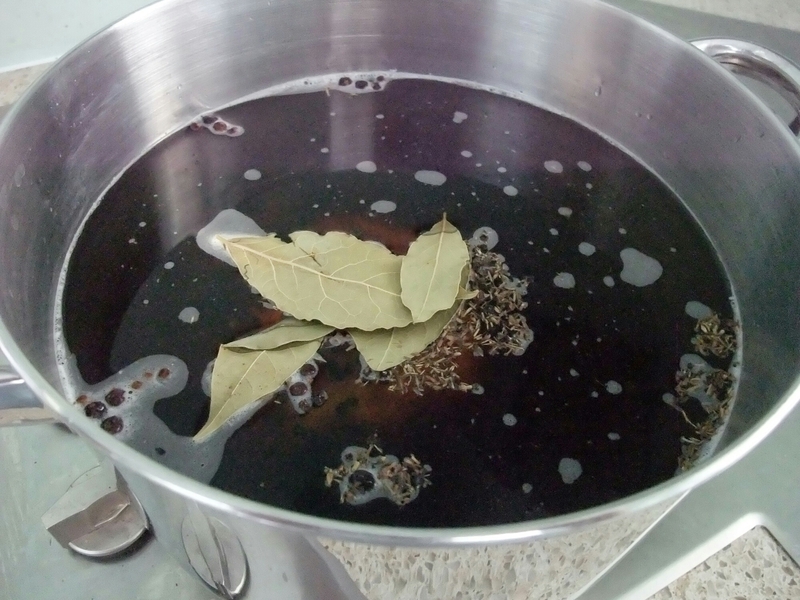 Pour water and rest of the brining ingredient into a large saucepan and heat until the salt and sugar are completely dissolved. 2. Leave to completely cool. I tend to leave it overnight to be sure as it is very important that there is absolutely no residual heat in the brine when you put the pork belly in it. 3. Pour the completely cooled brine into a lidded non metal container (I use tupperware) big enough to hold the liquid brine with the pork belly in it. 6. 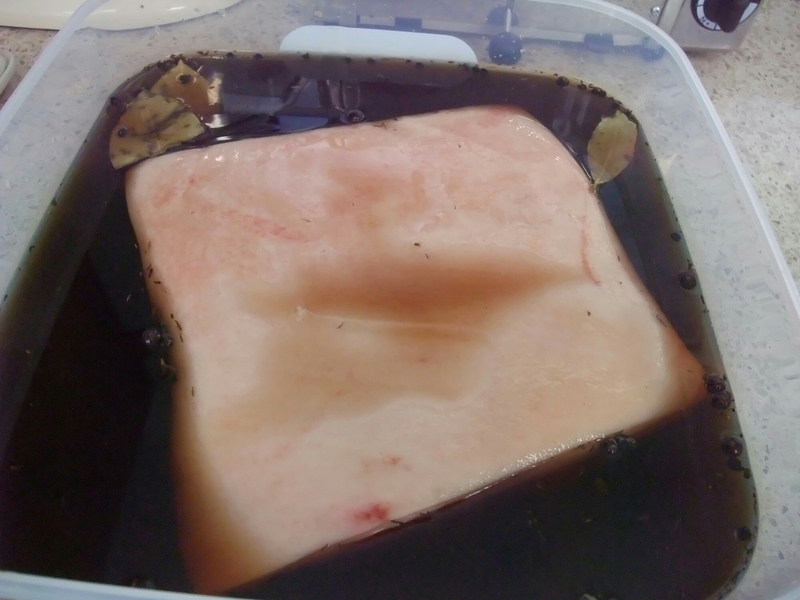 Put in fridge and leave it for 5- 7 days ( no more than 5 days if pork joint is less than1.5kgs – the longer you leave it the saltier the end product will be), turning the pork belly over in the brine on day 4(3). After 7 days (5 days if any smaller than 1.5kgs) take the pork belly out of the brine and dry thoroughly with paper towels and voilà you have bacon. 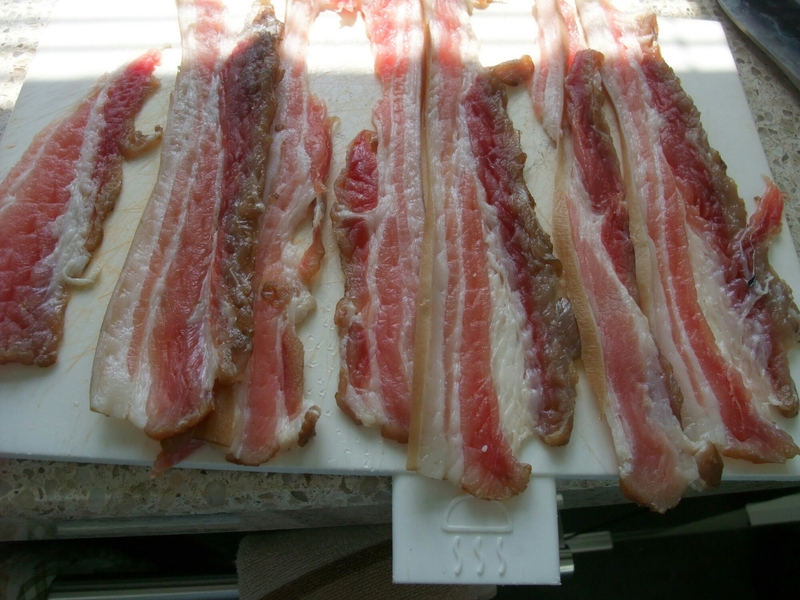 I trim the edges that may be a bit salty to get a nice trim block of bacon. 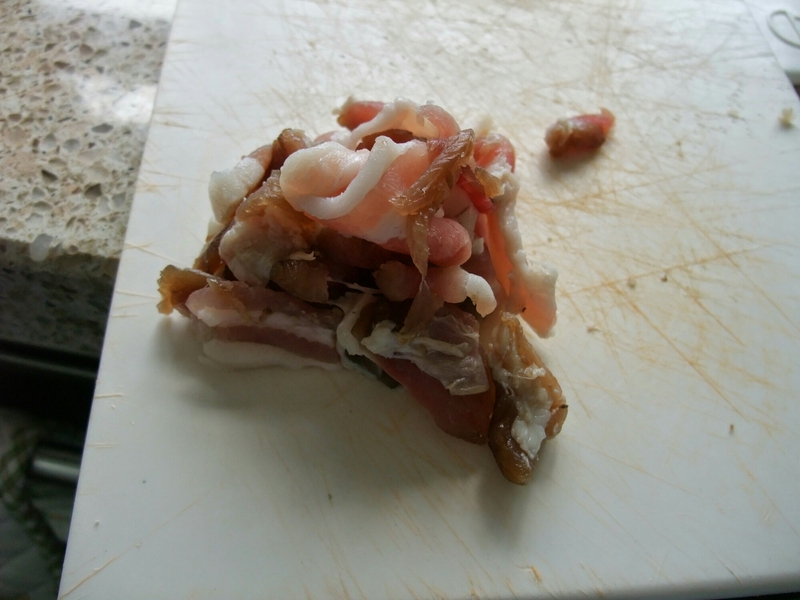 I use these offcuts as lardons. If possible hang it (wrapped in muslin) for a couple of days in a cold dry place to allow it to dry out bit. If you want to short circuit this bit put it in a fan oven on defrost (no heat just the fan) for 4-5 hours. Use as you would shop bought bacon – yummy. 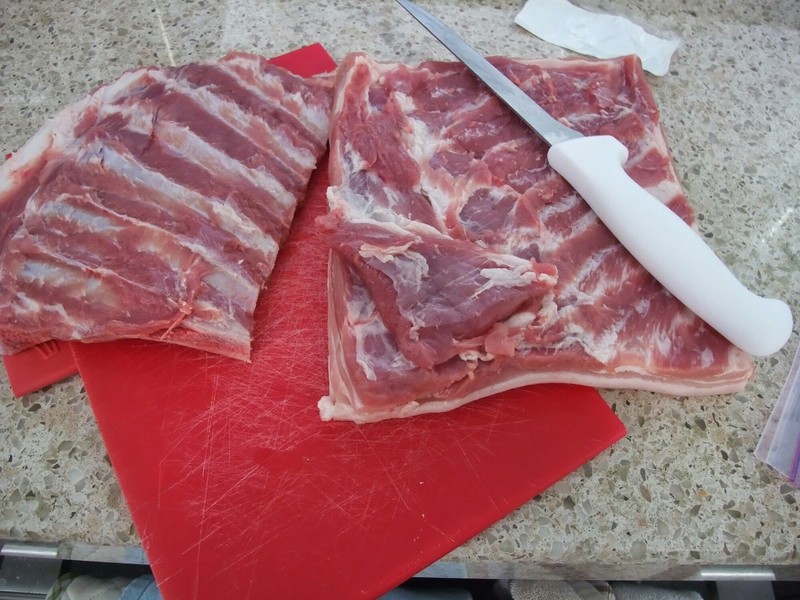 You will need a very sharp knife or a good slicer to cut rashers to a reasonable thickness. If you cut it too thick (as I am totally cackhanded I always do) just use a meat mallet or rolling pin to get it to an appropriate thinness. I like it a bit thicker than shop bought bacon which can be ludicrously thin. An easy and simple method that gives you a lovely flavoured bacon that goes nice and crispy and doesn’t shrink or leak water. I have done it a couple of times and it works a treat. Please note the bacon may be a little bit saltier than supermarket bought and will actually taste of something – that’s because it’s proper bacon. Give it a go – you know you want to. 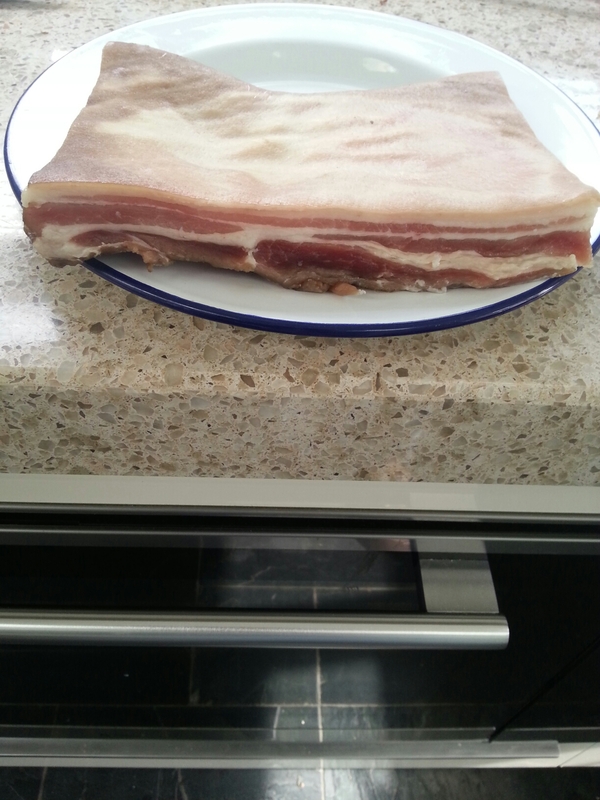 This entry was posted on Aug 3, 2014 by solicitingflavours in Bacon, Cardiff, curing, Food, Food and wine products, home cooking, Wales.